She was the daughter of the President. She never expected to lead a rebellion. With allies and plans falling into place, Poppy knows the time is near. To return to the capital. To face her father’s killer. And when a plot to murder innocent civilians is discovered, she knows it’s time to act. But little does she know there’s a traitor amongst them. And the betrayal runs deeper – and more deadly – than she could imagine. With time running out, lives at risk, and the resistance in disarray, Poppy must dig deep to discover just how much courage she has. The old Poppy could never do what was now necessary. Her enemies had always been one step ahead of her. But the old Poppy no longer exists. And the new one is determined to finally turn the tables. To face the man she once loved. And to finally free her nation. 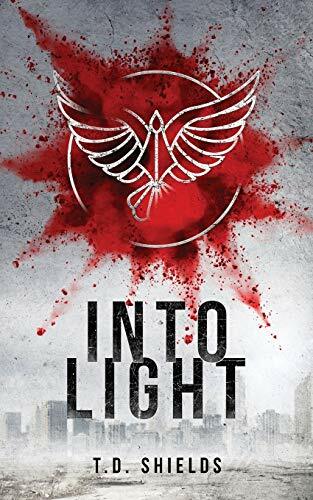 With great characters, unexpected twists, and a story that races, this conclusion to the Shadow and Light series will keep you turning the pages until its dramatic end. Get your copy of this dystopian thriller today. People who know me have asked how on earth I find time to write. After all I have a full-time job, an occasional weekend job, a husband and four kids to take care of, so where does time to write fit in? Luckily, I'm a bit of an insomniac and my most productive hours are between midnight and five a.m. - It's the perfect time to write! If I tried to go to sleep I'd just be laying there writing a story in my head to entertain myself; so why not just write it down instead? I have been writing stories in my head for as long as I can remember. I'm an avid reader, but if I find myself without a book handy I can pass the time by just writing a new story (or continuing an old one). Even though I've had the stories in my head for all these years, I never quite took the plunge into writing them down to share with others. The idea of letting other people into that private world in my imagination was just too scary. What if they're bored? What if they laugh? Worse, what if I'm trying to be funny and they DON'T laugh? My sister finally convinced me to give it a try and I first wrote this series just for her. Even though I wrote the book, I'll tell you honestly that I still love to read it; it's just a really fun read. I hope you'll read it and enjoy it, too!